As a Christian school, we will always make time to give thanks for the sacrifice Jesus made for us through His death on a cross, and celebrate His resurrection three days later. As Pastor Rick Warren writes, “the resurrection of Jesus was the greatest demonstration of the power of God in all of history. Jesus was buried in the tomb of Joseph of Arimathea, a wealthy man who had bought a cave for his own burial. They put Him in the tomb and they rolled the stone in front of it. But the opponents of Jesus were worried about His claims that He would be raised from the dead. To stop the disciples from making it appear that this had happened, Pilate agreed to allow them to seal the tomb. Isn’t it ironic that Jesus Christ is the only person is history whose grave was guarded to keep Him from coming out? Notice what happened. In Acts 1:3 “After His (Jesus) suffering, He presented himself to them and gave many convincing proofs that he was alive. He appeared to them over a period of forty days and spoke about the kingdom of God.” Notice it wasn’t just a onetime shot like “Surprise! Here I am!” and then He’s never seen again. That could have just been a psychological vision. It could have been a dream. It could have been mustered up in the midst of people in deep grief. No, it says many, many demonstrations that He was alive. It says for 40 days He continued to appear to them and tell them about the kingdom of God. He didn’t just show up once. For forty days He’s walking around the streets of Jerusalem and all kinds of people are seeing Him. That’s why about half the city became believers. Archaeologists and historians tell us that within twenty years of the resurrection, Jerusalem, a city of about quarter million people, had between 100,000 and 125,000 believers. Why? Because so many people had seen Him. That’s the guy we just put on the cross! That’s the guy the Romans killed. He claimed He was God, and look! He’s back. In Romans 1:4 we are told, ‘By being raised from the dead He proved He was the mighty Son of God with the nature of God Himself.’” The power that raised Jesus Christ from the dead, it is available to all of us when we invite Jesus Christ into our life. The question raised in John 11:25-26 is clear ‘Jesus said to her, “I am the resurrection and the life. The one who believes in me will live, even though they die; and whoever lives by believing in me will never die. Do you believe this?’ Jesus offers to be our Saviour, and I encourage you that if you haven’t already made Him this in your life, that this Easter you seriously consider saying Yes to His question. 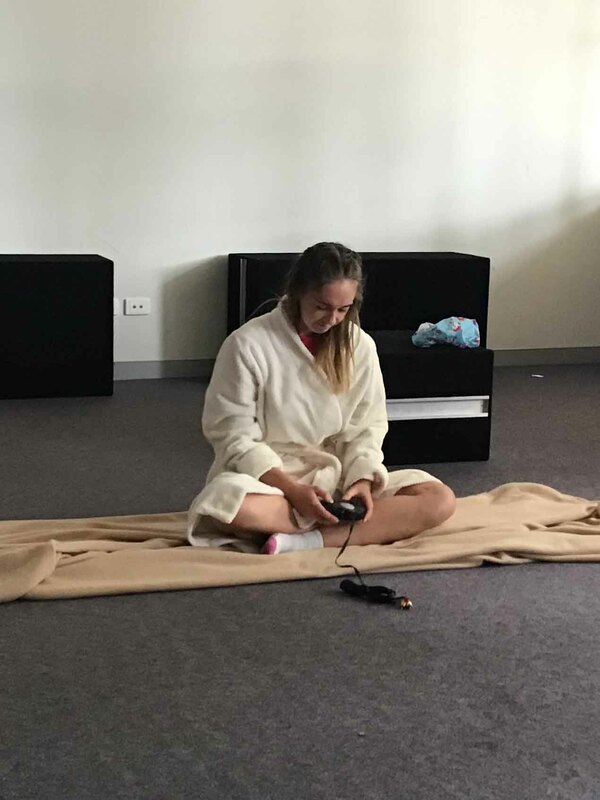 Our Easter Prayer room is up and running again, thanks to some dedicated and creative staff and students- Jess Roberts, Lisa Duggan, Dereje Aby, Jessica Pierce, Libby Scholtens, Jenny Yu, Craig O’Meara and the SRC to name a few. All classes are visiting the room this week to view and experience a mix of audio, visual, scripture, silence, song and, most importantly, opportunities for reflection and response as together we retell one of the greatest moments in history and consider the implications for the way we live in the world and in relationship with God and each other. The recent Cross Country day for our entire College was an outstanding event, and I am very grateful to Raylee Kelly and her faculty for the great organisation, as well as to all the parent helpers who assisted, both at our junior races at the Lyneham campus, and our older student events around Lake Ginninderra. We were blessed with perfect weather, and it was terrific to see the campuses come together for these special occasions. 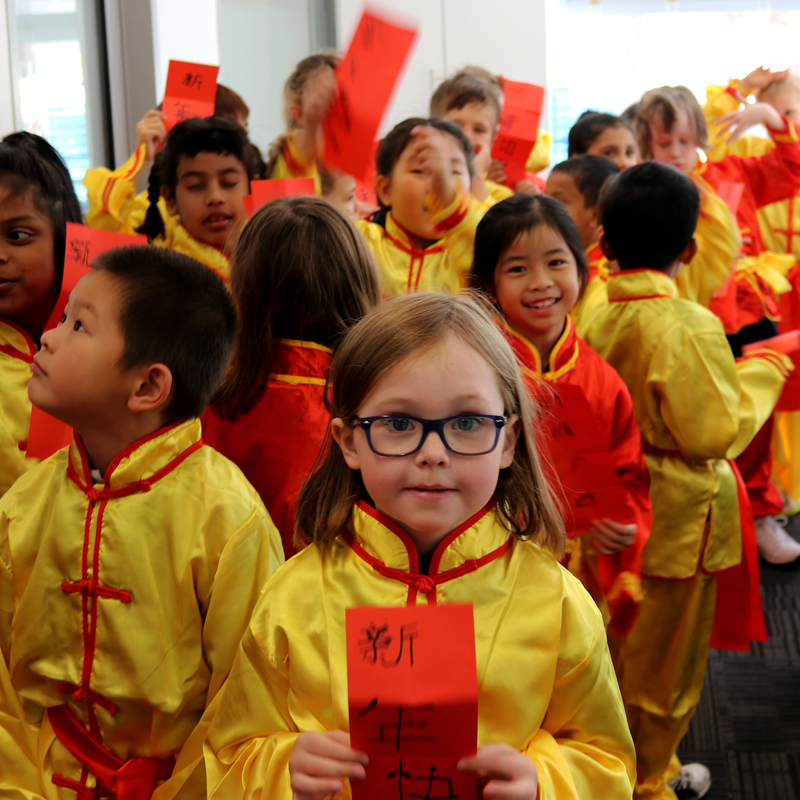 I was impressed with the fantastic behaviour our students displayed, from our Kinders to our most senior students. Students joined in with supporting their peers including in some cases running with the students needing some assistance, and contributing to house spirit. The College is committed to providing high quality education enhanced by a Christian World view. To achieve this, the College must continually adapt to the changing educational environment. The College is working to improve teacher-student contact hours which require an adjustment to the student timetables. In order to ensure that all BCC staff and parents have a voice on this workplace change, a Consultative Committee was established in mid-February. The committee is chaired by Jon Hunt-Sharman, a former BCC Board Chair. 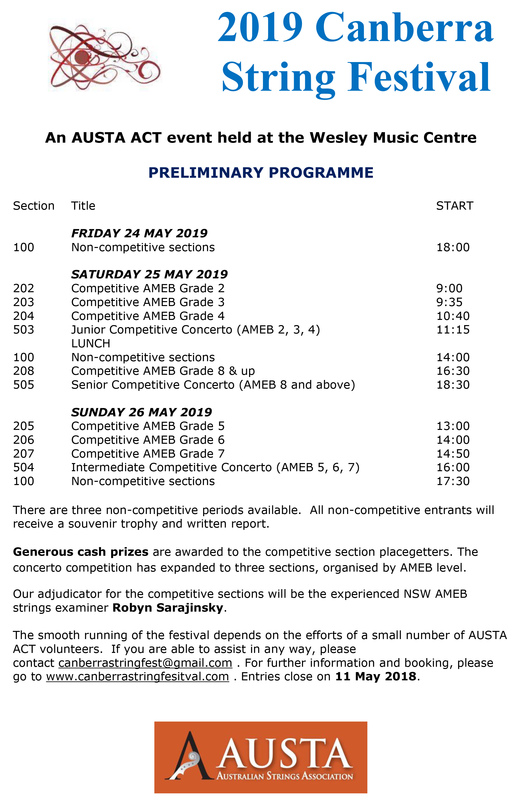 Currently, a document is with all staff and parents for comment back to the Committee via email consultativecommittee@bcc.act.edu.au by cob Wednesday 10 April. The purpose of the Committee is to consult with staff and parents/carers about the introduction of the proposed changes, the likely effect on students and staff, and the measures taken to avert or mitigate any adverse effects of such changes. This committee is not necessarily a permanent body but will be looked at as a possible avenue to ensure consultatively looking at significant change in the College into the future. Tomorrow night, Thursday 11 April, there will be a meeting at Daramalan College in Dickson regarding the change to bus timetables and the start of the new Light Rail. This meeting has been organised by APFACTS and I encourage all our families impacted by the new bus timetable changes to attend and ask questions. Last week I met with representatives from Canberra Metro and was very concerned to learn that while their Customer Services Officers will travel on the trams, there will be no Customer Service Assistants (employed by Transport Canberra) to be at the Dickson interchange in the first few weeks of next term, rather Canberra Metro and Transport Canberra intend to ‘monitor closely’ how students go. Recently some of our music students performed for the residents of the Sir Leslie Morshead Manor. The feedback from the residential care staff was very positive: “on behalf of the residents we wish to thank you, your music team and the students for the wonderful performance you gave us. The residents were full of praise for the way it was organised and how well behaved the students were. So a big congratulations to all of you. You are always welcome to come to the home and be with the residents.” It’s wonderful that our students can bring some joy to the days of the residents, and I am grateful for the College staff who made this event happen. I trust all our families and staff have a safe and restful school holiday break. We know that when parents are engaged in kids’ education, children are more likely to enjoy learning. They’re more motivated to do well. 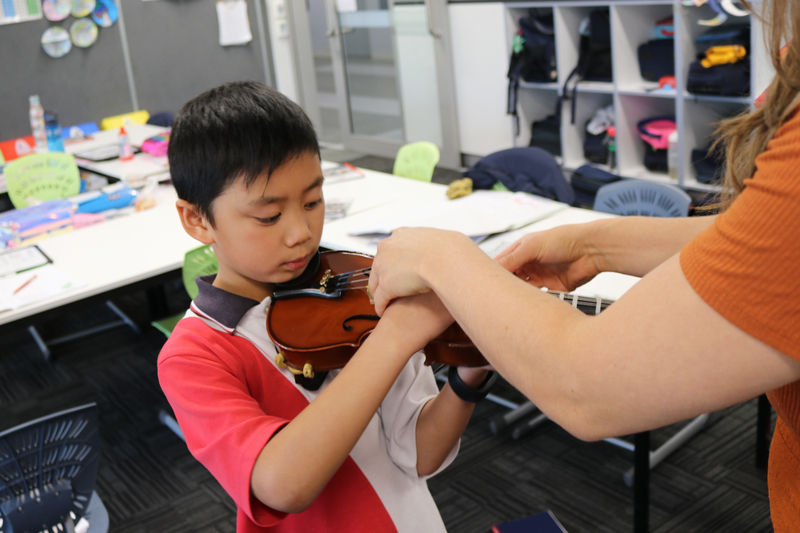 Even social outcomes and confidence at school are improved when parents are engaged in the learning process. Students are more likely to graduate, go on to further education, and have better rates of school attendance. 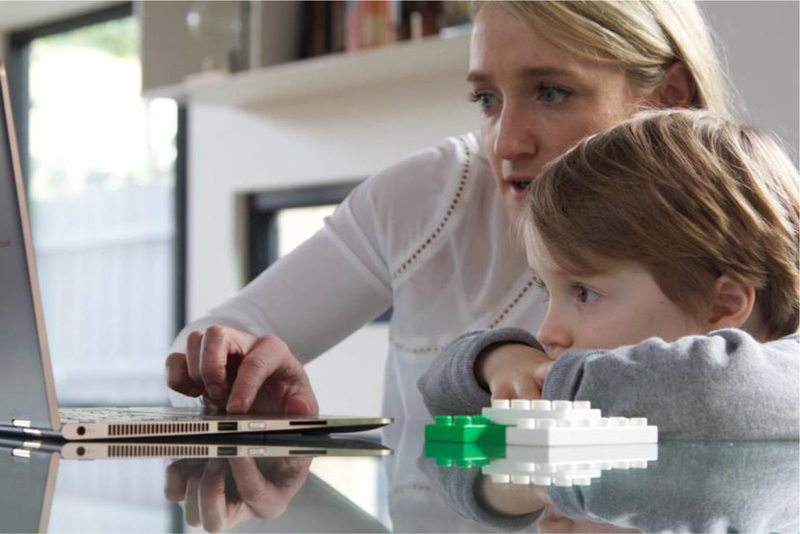 So what does parental engagement in education look like at home? Here are a few ideas for the holiday! Go to the library or the book store and find a book you can enjoy together. Shared reading promotes literacy development, and not just for young children. I was blessed to have a dad who read to us, even when we were teenagers and pretended we didn’t want to listen. Talk to your child about big ideas as well as everyday events. Canberra is full of great places to start a ‘big ideas’ discussion, with museums, art galleries, Questacon, as well as natural and man-made environments of all sorts. Go exploring! Learn something new together- enthusiasm for life-long learning is contagious. 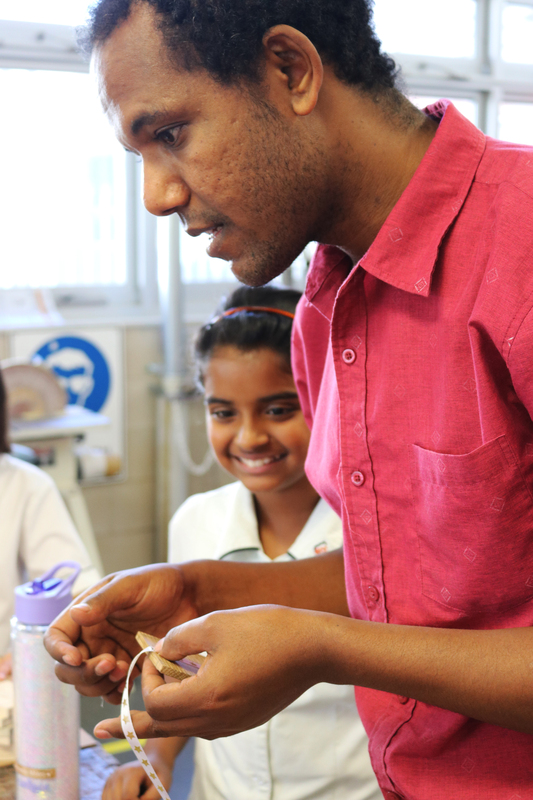 Whether it’s an “I wonder…” question or a practical skill like cooking or fixing something, learning together is fun. I look forward to hearing students’ holiday adventures when we return next term. Enjoy the two weeks of school-free time! 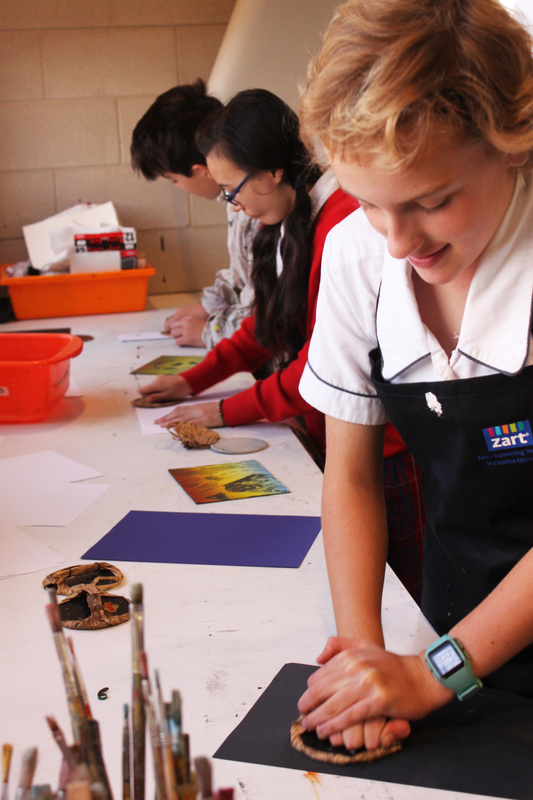 Year 7 students are completing lino prints as part of their study of Visual Arts. Students used their drawing skills to refine the design, cut the design into lino and then produced a series of prints to display their final image. 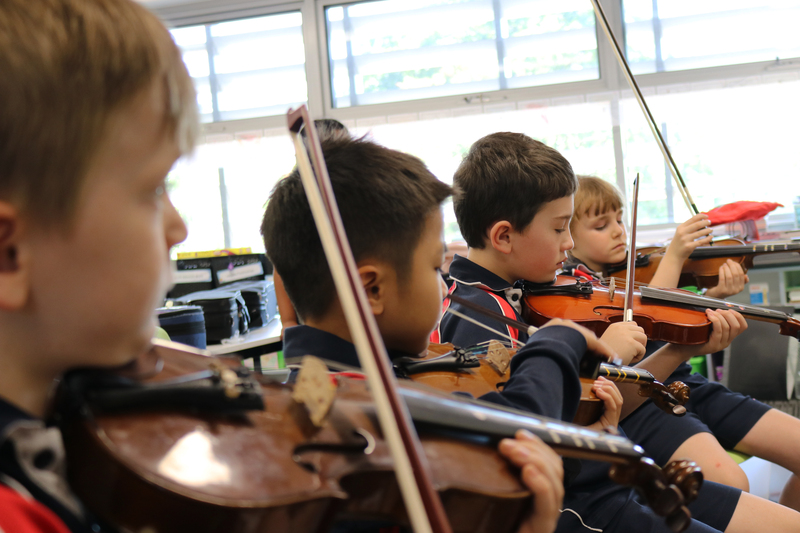 In Week 11, all Bands and String Ensembles are opening up their final rehearsal for parents. 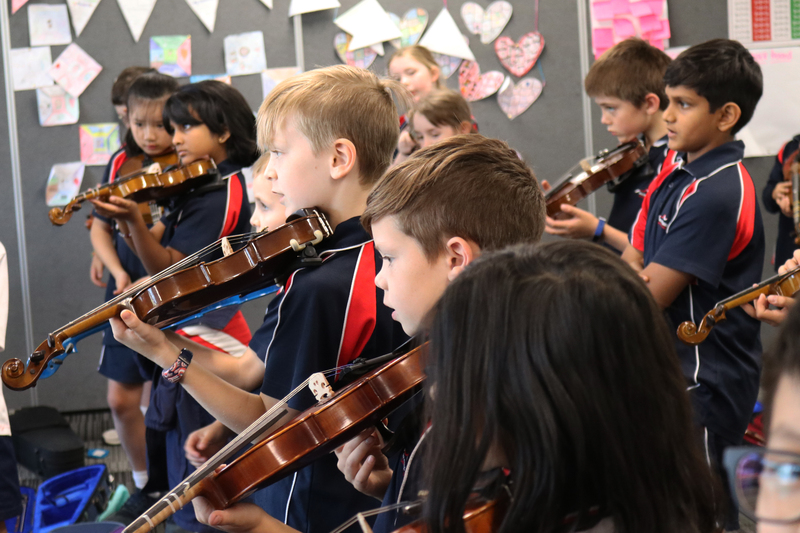 Music Ensembles: Show and Tell means that parents are invited to come along to the last 15 minutes of the final rehearsal of Term 1. 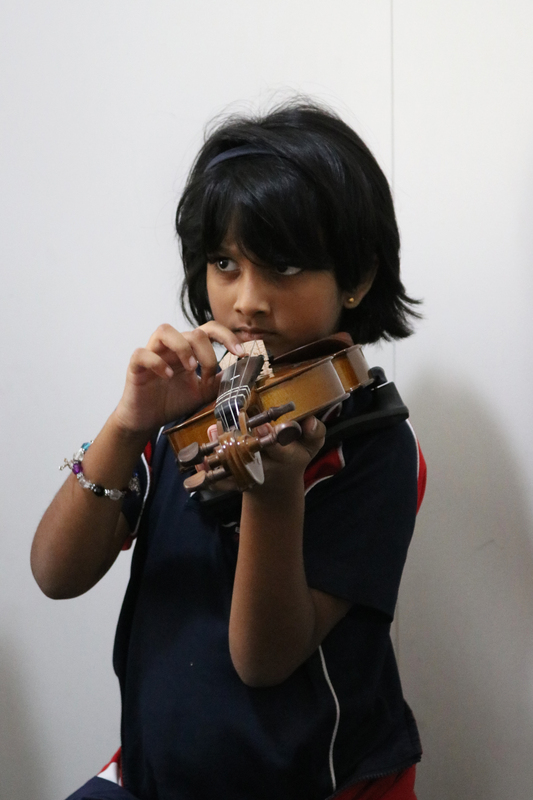 It is a wonderful opportunity for parents to see the progress students are making in their music ensembles. 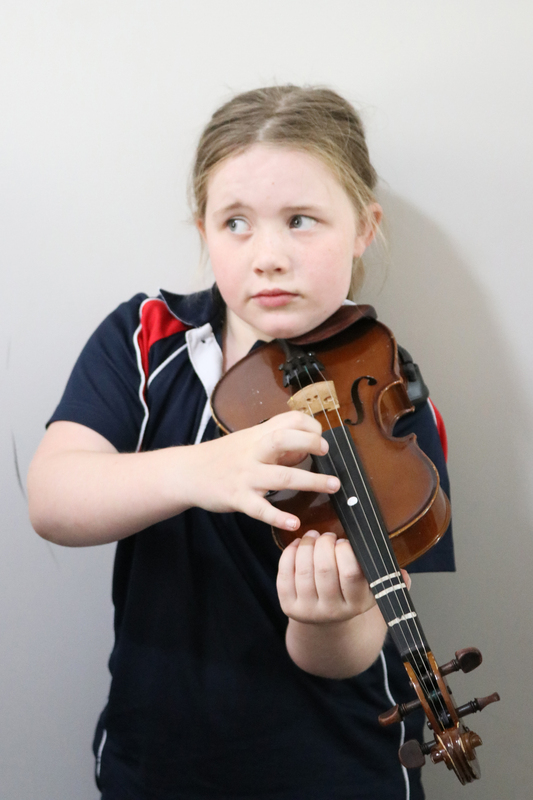 If you have any questions about the Creative and Performing Arts at Brindabella please get in touch. I look forward to seeing our students use their God-given creative gifts and talents throughout the College this year. Often students seek support from the Psychologists to develop supports for managing stress and anxiety and general mental health. One key requirement for a healthy mind and a healthy body is sleep. Often we hear individuals tell us that they are generally tired and have a poor sleep routine. If you or your child are an individual who has no difficulty with sleep, and are able to fall asleep without issue, you many not feel these tips are relevant. However, if you or your children experience difficulty falling asleep, some of the following points may assist you to improve you sleep quality. 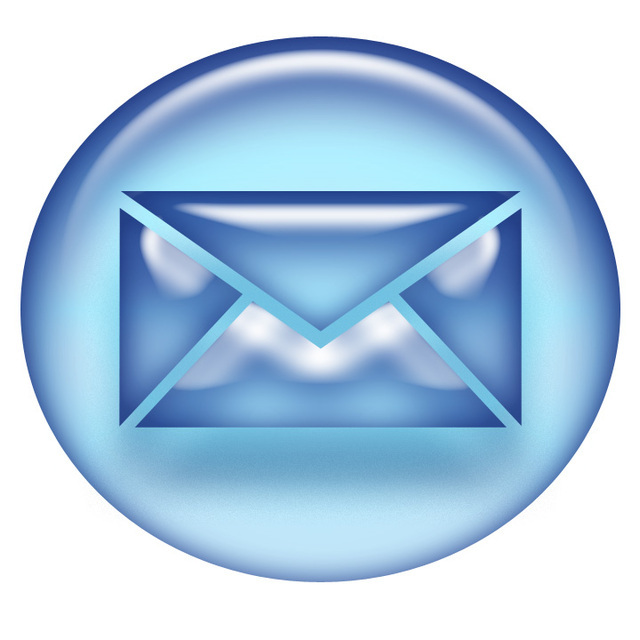 If you require more information or have concerns, please do not hesitate to contact us. We hope that you have an enjoyable and restful holiday break with an opportunity for good sleep. 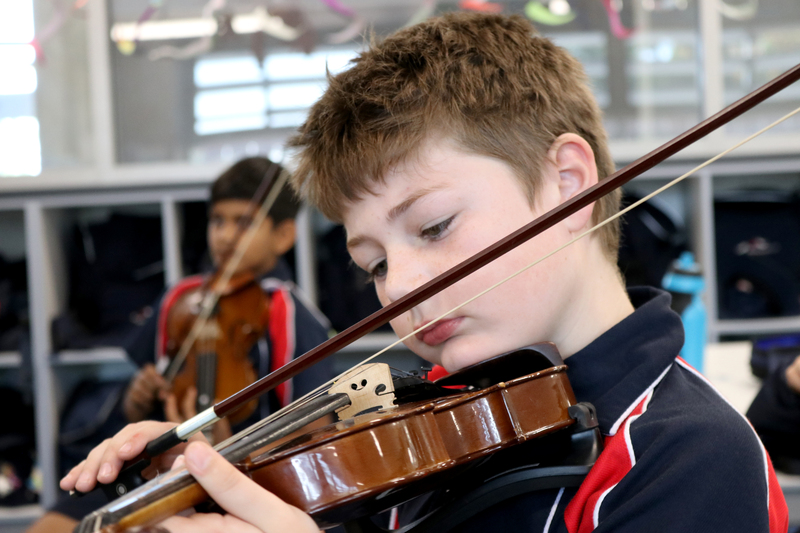 Interested in your child being more involved in the Co-Curricular Music program at BCC? 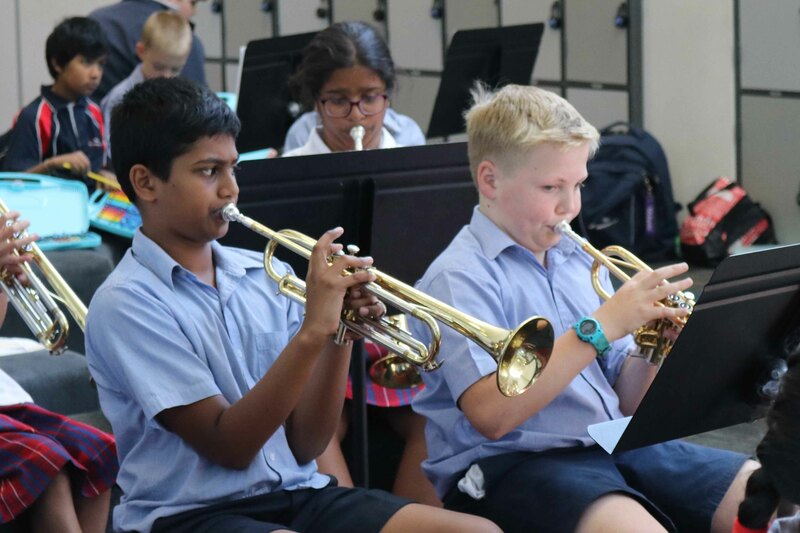 -	Hand completed form Ensemble Application Form (BCC App: BCC Music Notes/Ensemble Application Form) into student reception and contact the ensemble’s conductor via email to ask if your child is able to attend the next rehearsal. 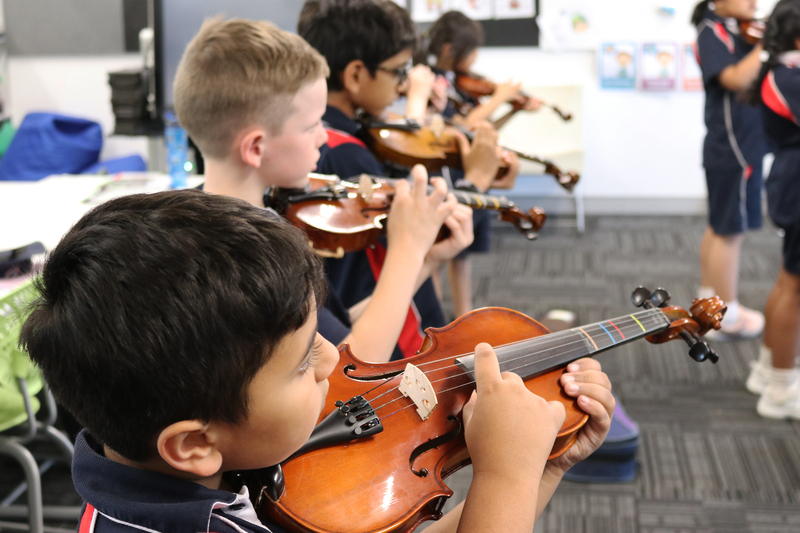 During this rehearsal the conductor will speak to your child about their instrumental experience and assess suitability. 4. Further questions? 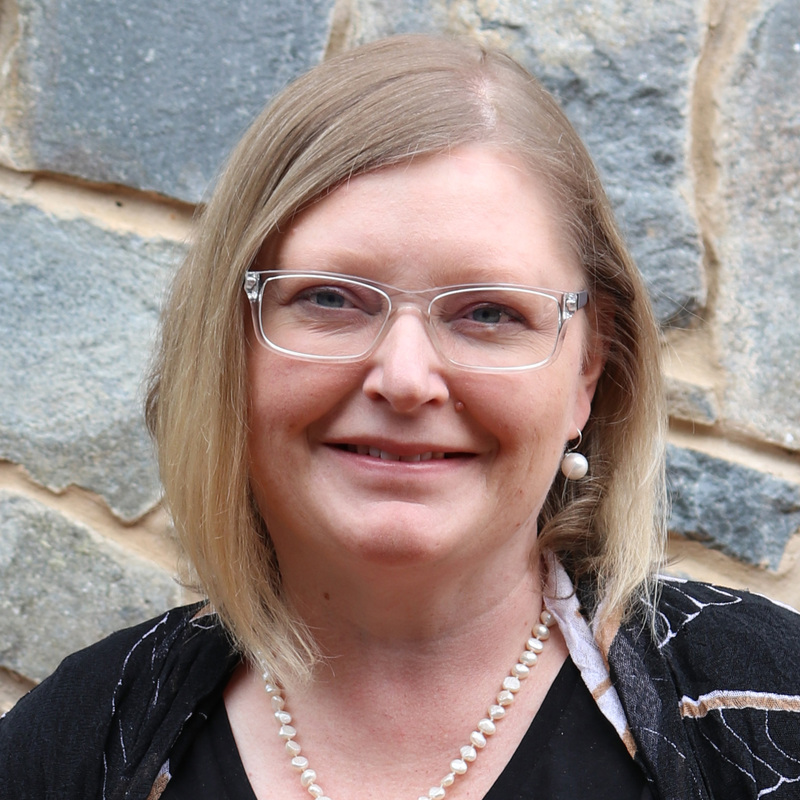 Contact Performing Arts Coordinator Jessica Roberts at jessroberts@bcc.act.edu.au Or Gemma White at gemmawhite@bcc.act.edu.au. 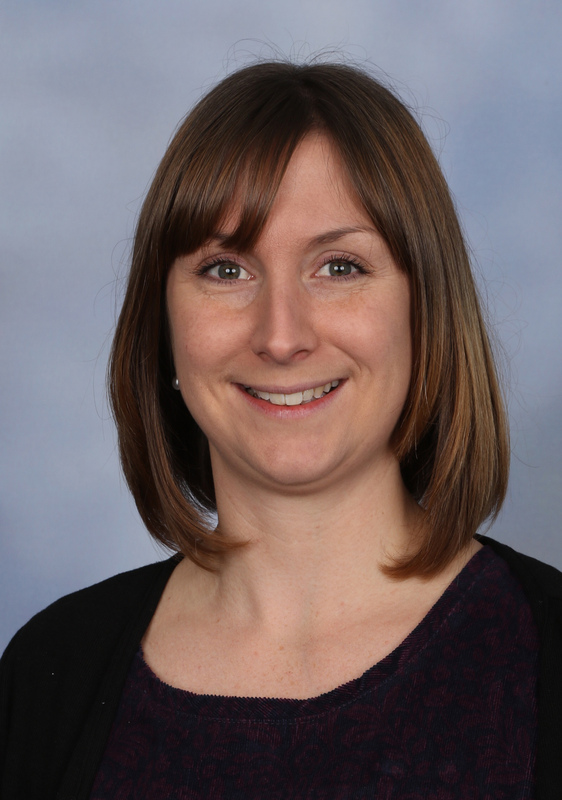 We have exciting news from the Careers Adviser, Mrs McMaster. 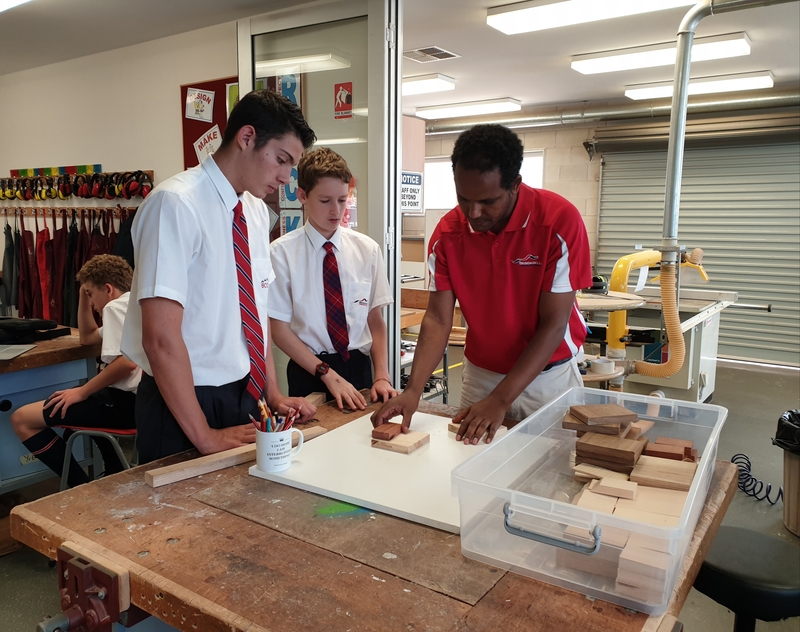 ANU Visit – The ANU visit to the school on Monday was very informative for our year 11 and 12 students and the staff who attended the presentation . The ANU is now taking online applications for next year’s 2020 intake. The applications are free and completely separate from the traditional UAC applications. They close early on the 31st May. 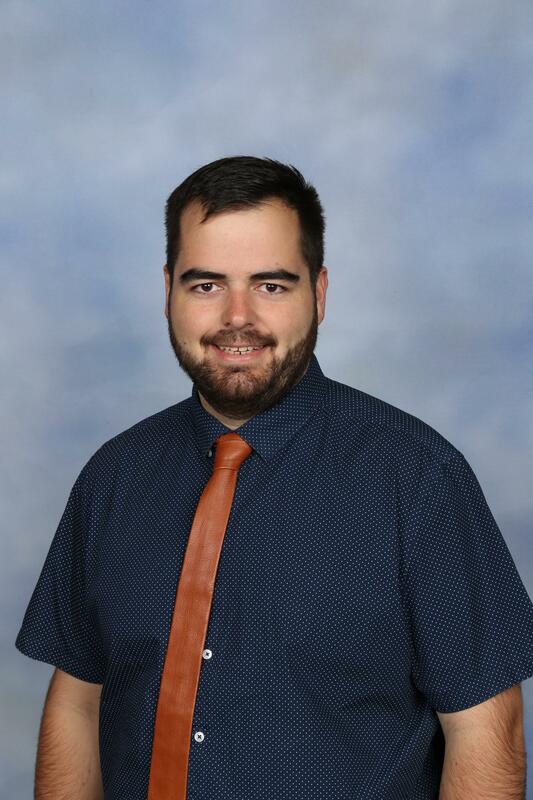 There is still the option of the traditional UAC entry method later in the year, however guest speaker Tim Friel, suggested that positions to the more competitive courses such as Health Science (which is the ANU pathway to Postgraduate Medicine) and Law would most likely fill with early direct applications. Follow the link below to do your ANU Domestic Undergraduate Applications. UAC Guides – These books are now available for each year 12 student. Please grab your copy from the Senior Study area. Please notice Page 6 for all the University Open Days coming up this year. In other Careers News, I have added information from the University Clinical Aptitude Test regarding the entry requirements for students wishing to start Undergraduate Medicine directly out of year 12. This is a course of study NOT available in Canberra, as we have Postgraduate Medicine Only. Please check out this information if your student is in years 12, 11 or 10 and thinking about a career in Medicine. 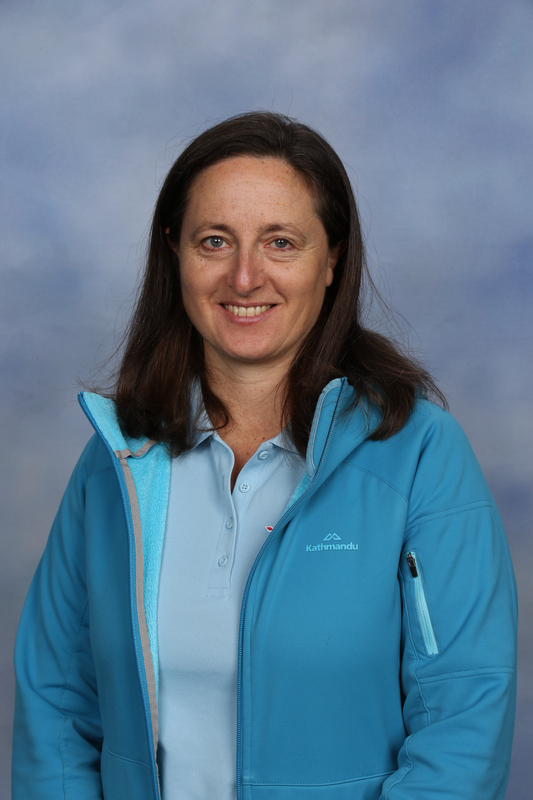 Or contact Ms Rebecca Lovett, rebeccalovett@bcc.act.edu.au for further information. Beginning Term 2, all students will need to wear the winter uniform. The Uniform Shop at the Charnwood campus will be open during the school holidays. Term 2 and 3 are the final times that the old uniforms and logos on winter items will be worn. Term 4 is the last time summer uniforms with the old logo will be worn. As of 2020, only the new logos and uniform styles are to be worn. 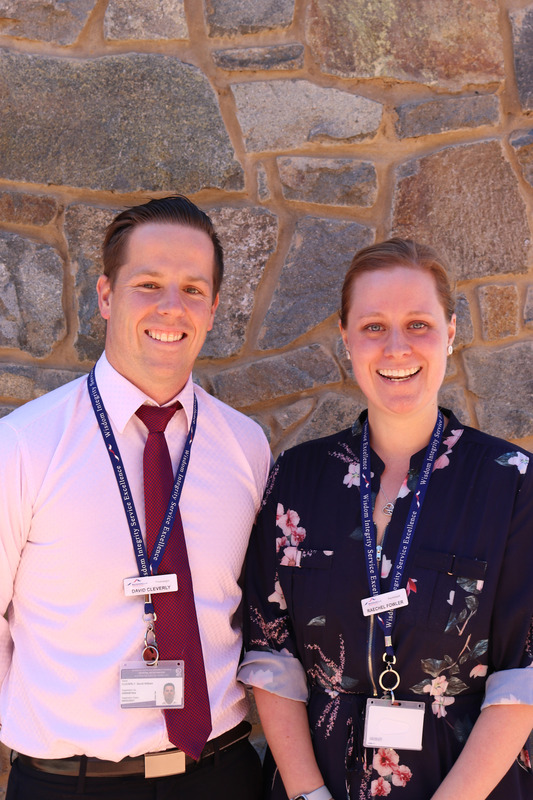 The shop hours can always be found at http://www.bcc.act.edu.au/lyneham/enrol/uniform. Being a parent is the hardest job we’ll ever have. All parents at some time experience difficulties and stress. Parentline ACT is a confidential and free telephone and face-to-face counselling and information service. •	To talk with someone about those parenting issues. •	Help with some ideas on raising children. •	Support in the important job you are doing. •	To know what is available for parents, teenagers and children. •	To build better relationships in your family. •	Help to understand your child or teenager’s behaviour. •	Make an appointment for a counselling session. Monday to Friday (except on public holidays), 9am to 5pm. We love hearing from our BCC families. Should you have a query or concern about your child’s learning please be sure to contact their Class, Pastoral or Connect Group teacher in the first instance. Should you not be able to resolve the matter, it is advisable to then make contact with their relevant Head of Faculty and Head of Pastoral. This can be done by phoning the school or emailing the relevant staff member. If you don't know your teacher's full name, please visit our BCC Phone app, as there is a list of Faculty Heads and Heads of Pastoral. 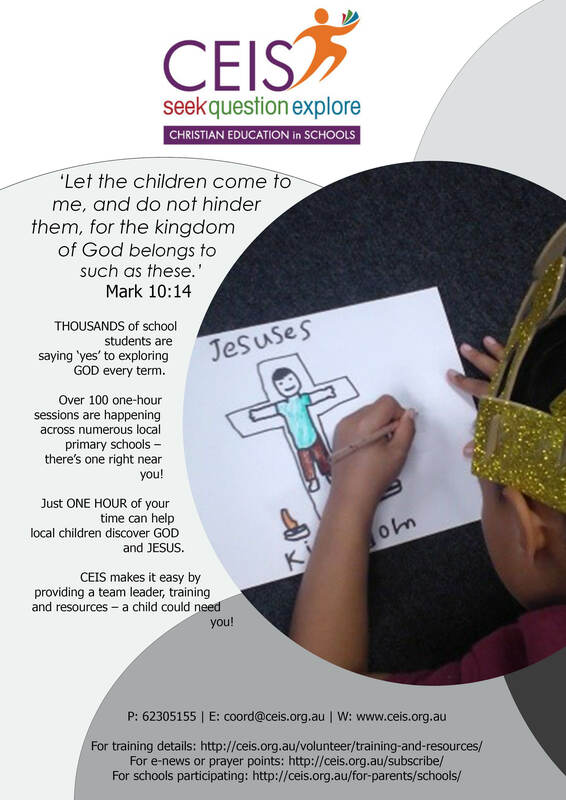 As we approach the Easter holidays and welcome the break from our formalised lessons in the ELC, we are also reminded of the unfailing and incomparable love of God. 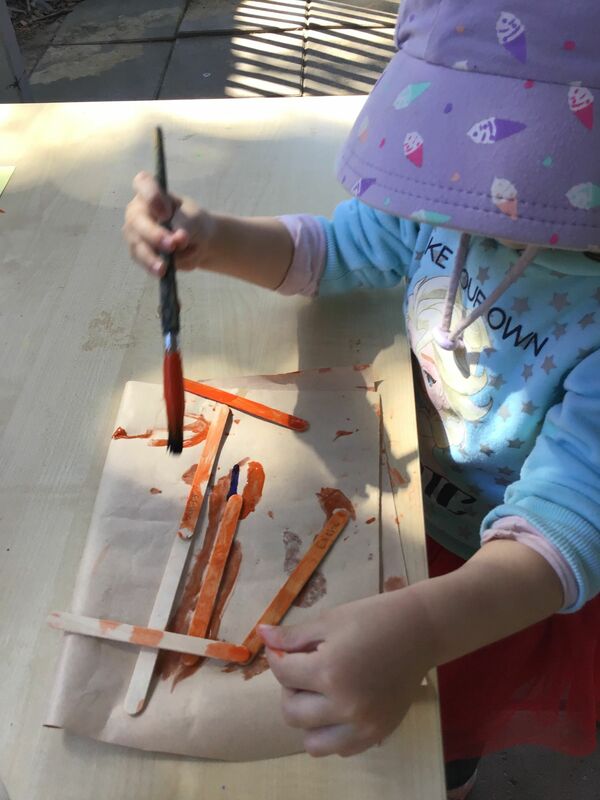 You will see in the classrooms of the ELC that there is a range of artwork and learning happening surrounding the Easter story and the lessons of love that we are promised through the Easter story. We teach the Biblical truth that no matter our actions, God loves us and celebrates with us- this is exciting as in this commercialised time of Easter we are reoriented to God and of course, His son Jesus. The Easter message also reminds us of the theological importance that God is never far from us. 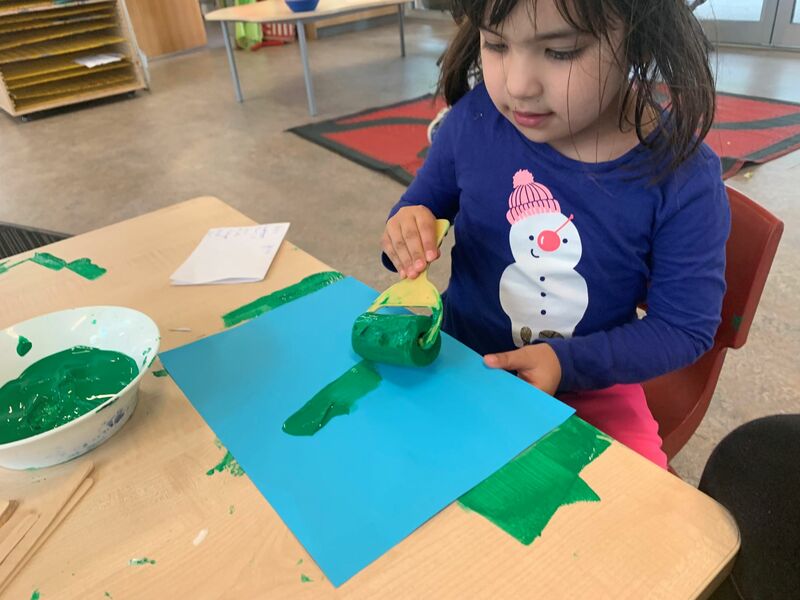 For small children the concept of never truly being alone is a comfort and a support, especially through transitions which we have seen at the beginning of the year. Reminding the children of the ELC and ourselves of the importance of the relationship that we have with Jesus is such an important message that we, as Christians return to again and again. We pray that you have a safe and blessed Easter break and that you enjoy your time spent with family and friends. 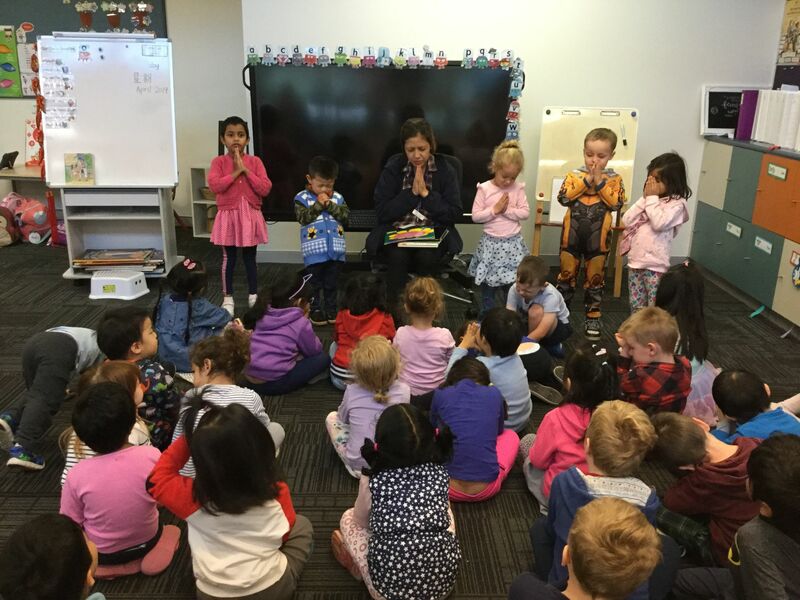 The children of the ELC partake in prayer and reflective moments throughout the day. As part of our Biblical Living lessons we encourage children who would like to pray and give thanks to God, to do so. This is voluntary and we are so happy that our children are able to build and develop their relationships with God. The children in the P3 class have been partaking in creating artistic responses to the story of Easter. We would love to have you come and see the learning that is happening! You may even like to ask our children if they can tell you a little about the Easter story. The children of The Castle have been learning about patterns and that patters are a series of shapes or colours that repeat again and again. 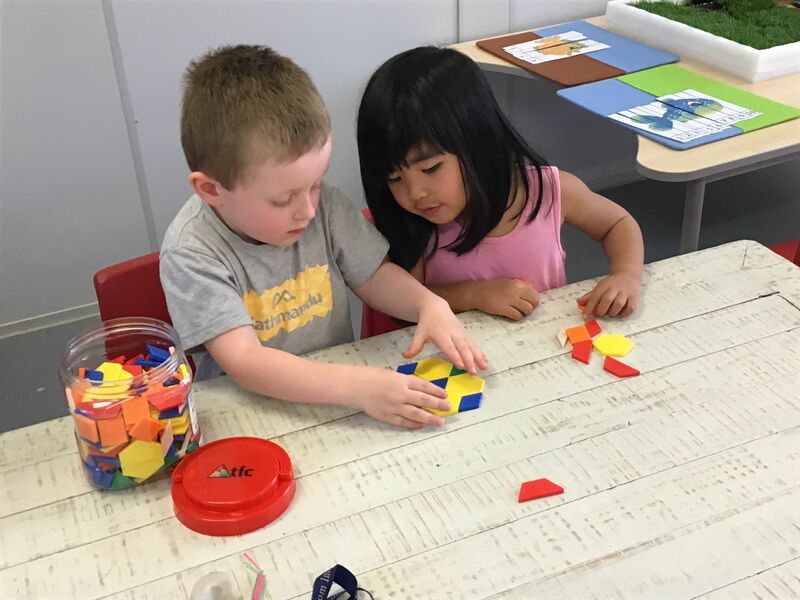 This is an important part of foundational mathematical concepts and learning, which they will continue into Term 2. We have seen lots of beautiful artworks in the different classrooms, we have seen crosses in preparation for our Easter learning- come and have a look at the beautiful work! There is a whole College Easter assembly on Thursday 11 April at 10:30am in the JS building. All parents are welcome to join us for this special event. Last Tuesday the K-2 and 8 year olds, had their Mini Cross Country Carnival at Lyneham campus. Our Charnwood students and staff joined us for this morning. 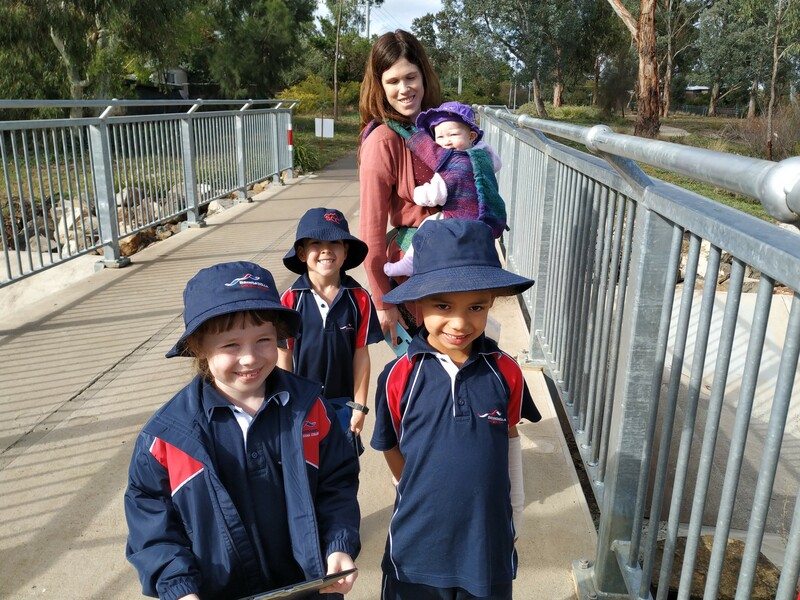 The students ran a 1km course (800m for Kindergarten) which took them to the far end of the oval, across two bridges and back. All children are to be commended on their sportsmanship and support with cheering on their peers. There will be further information early Term 2 for those 8 year old students who qualified to go to the Zone Carnival. 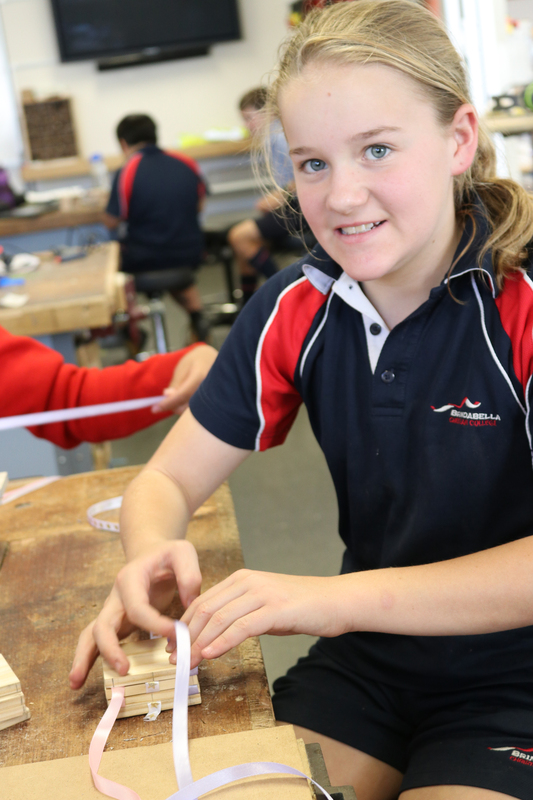 The past few weeks of this term the JS teachers have begun to implement components from the Bounce Back Program. Bounce Back is an award-winning, wellbeing and resilience, class-based program for children and young people from Kindergarten to Year 6. Bounce Back promotes positive mental health, wellbeing and resilience for students and teachers plus safe and supportive class and school learning environments. Next term I will be including a parent section in the fortnightly newsletter which will offer you ideas you may wish to discuss with your child/children. We have had a few children wearing Apple watches to school. Can I please ask these are not worn to school? They are an expensive item which could be easily damaged during play or sport times. We also ask that parents contact the classroom teacher or Student Reception directly if there are changes in pick up arrangements or messages need to be given to the children. Having a child take this responsibility on themselves could possibly lead to confusion and a risk to the teacher’s duty of care. Thank you for your support of this matter. We still have an excessive amount of lost property with un-named items. Please ensure all your child’s belongings are clearly labelled and remind them of their responsibility to look after their belongings. If your child has lost/misplaced an item remind them to check the lost property before the holidays. We have several people in our school community who are going through challenging times. Please keep all these families in your prayers. May they find strength and peace in the knowledge of God’s love for them. I have been blessed with the opportunity to travel with the Senior students on their China trip these coming holidays. I will be leaving on Thursday 11 May. I would like to thank each of you for your support this term with ensuring your children are in correct school uniform, on time to school and offering your assistance in the classroom, on excursions or at carnivals. The relationship between school and parents is very powerful and your children will certainly benefit from your support. I wish you all safe and restful holidays and I look forward to seeing you all back on Monday 29 April. It was a wonderful adventure where students put their road safety knowledge into practice. 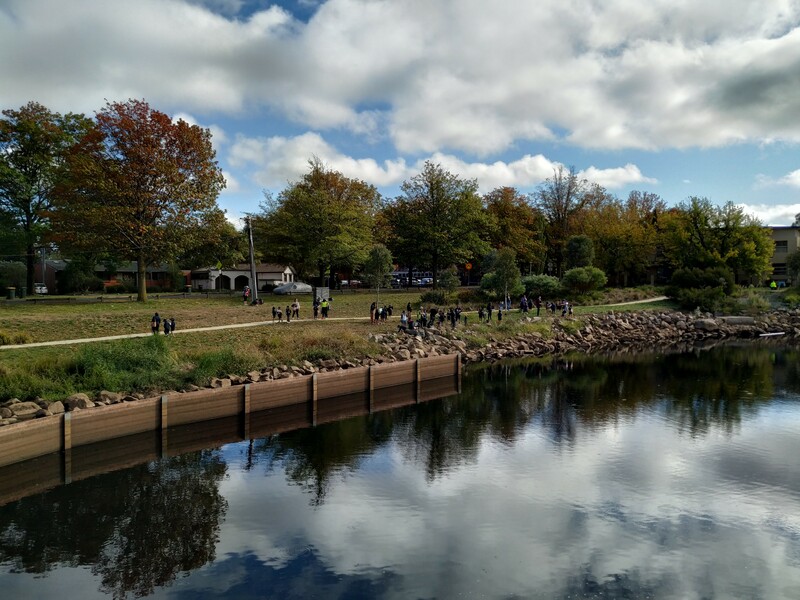 They hunted for creatures big and small, looking for habitats and using detective skills to sort out the constructed, managed and natural features of the area. When they got back to class, students drew a map of what we saw using a bird's eye view and created their own symbols for the map key. It was a fantastic day! 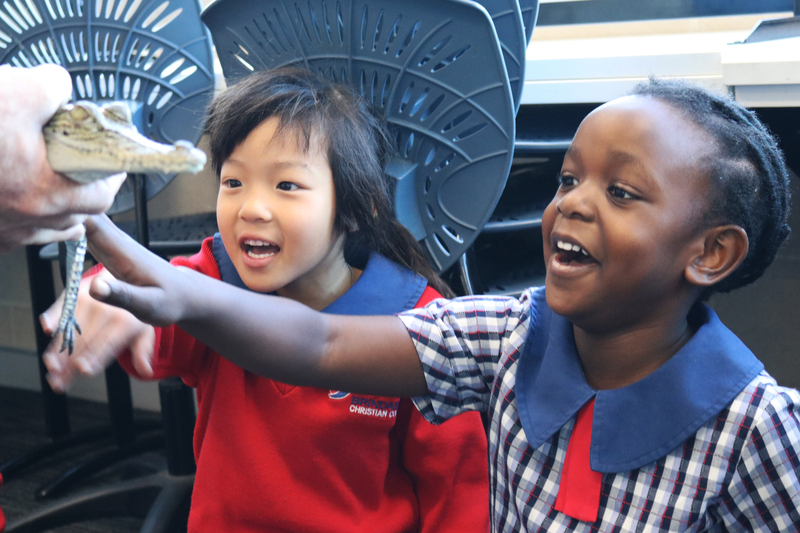 Every Friday, Junior School gathers to celebrate and share their learning with each other. Each class will have an opportunity to lead this assembly. On the weeks where no class is timetabled there will be a Worship assembly. All parents, grandparents, carers and relatives are invited to attend these assemblies. 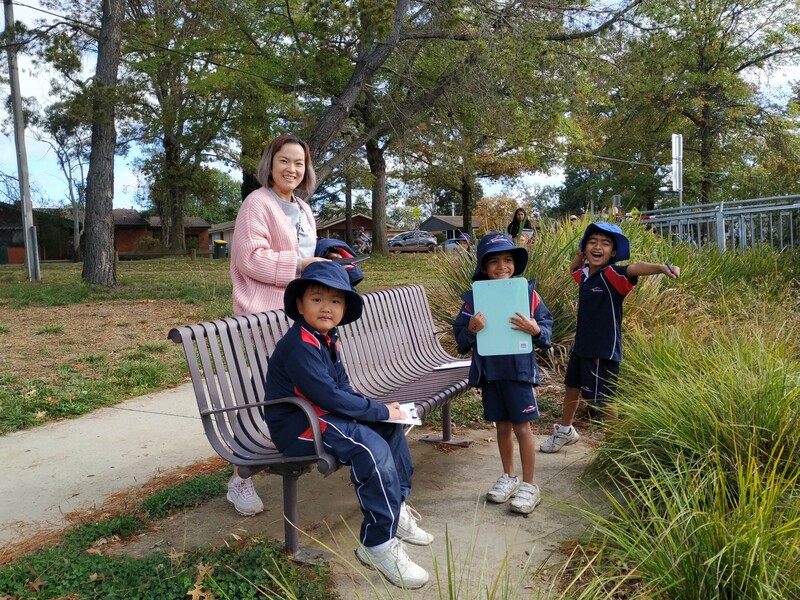 This term, Year One have been exploring natural and constructed environments in Geography and investigating the animals that belong to these environments in our Schoolyard Safari science unit. 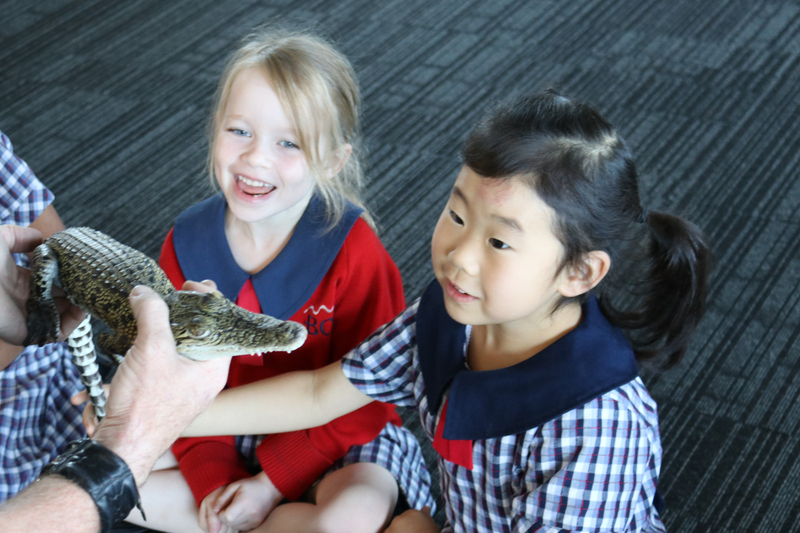 Year One participated in an incursion from The Canberra Reptile Zoo where they were visited by Blue Tongued Lizards, Long Necked Turtles, a Fresh Water Crocodile and an Australian Python. We learned about how their physical features can tell us about their habitat, what they eat and their potential predators in nature. 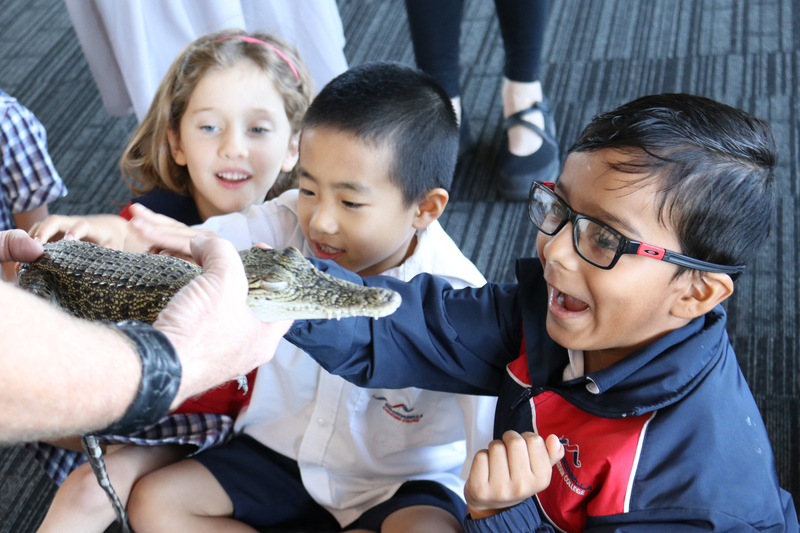 During the experience we were given the opportunity to come up close to the creatures, getting to feel their scales and smooth and squishy bodies. 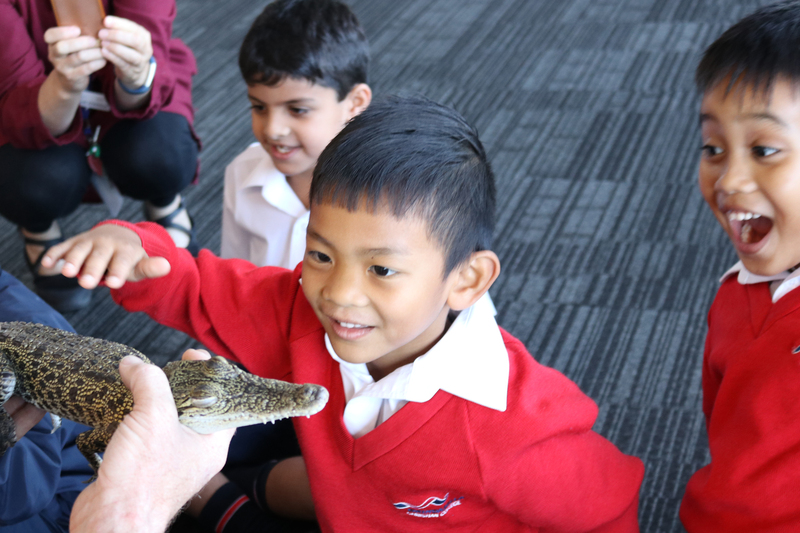 Year One showed their bravery to overcame their fears and engage in patting and touching the animals. 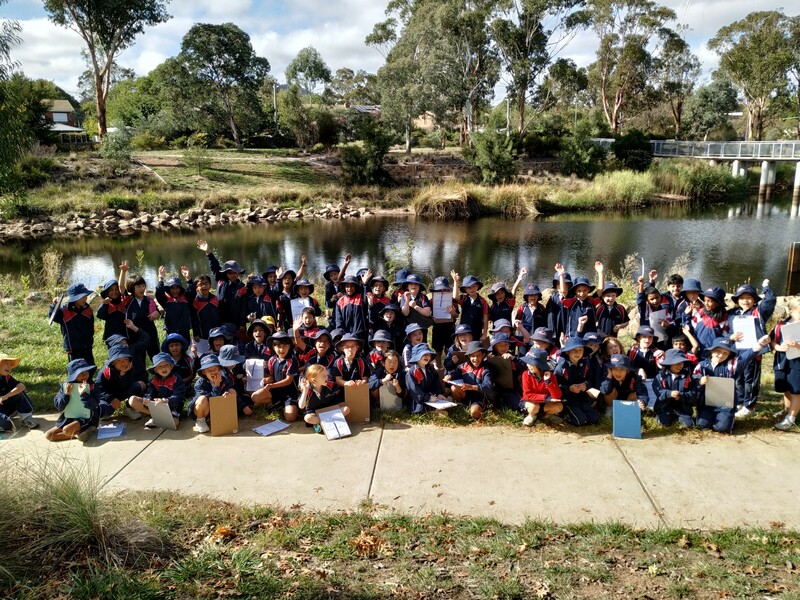 Overall, Year One had a great time and we will be able to apply what we learned in class learning more about habitats and environments. 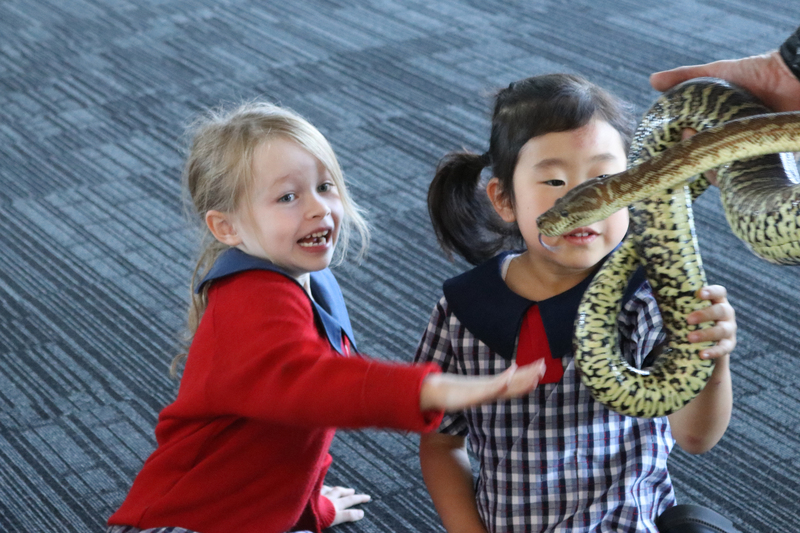 Thank you Canberra Reptile Zoo for the fun and engaging visit to our Year One classes. 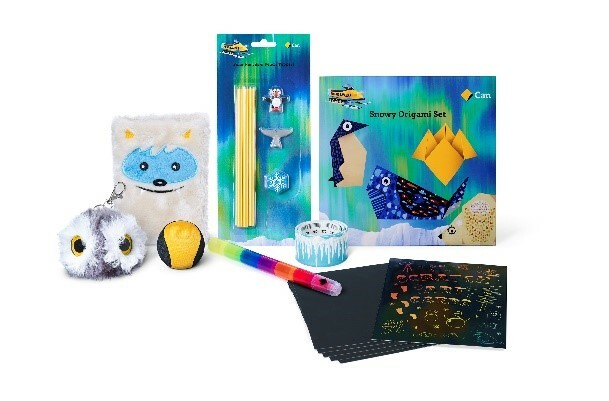 Exciting new rewards for 2019 are now available! Get involved in the School Banking program. 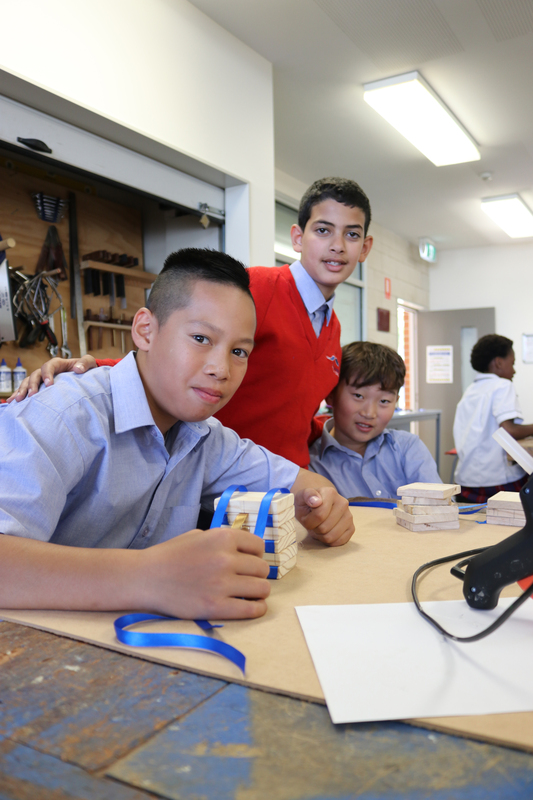 Brindabella Christian College is excited to offer the Commonwealth Bank School Banking program to all students. School Banking day is Tuesday. Each week you need to hand your deposit book to your classroom teacher or Student Reception. The holiday brings with it a time for rest and relaxation. I would like to extend a prayer to all our families that they have a safe and happy Easter, particularly to those families that are going to be travelling for celebrations. I also ask that all of us in our community pray for our staff who have been through a very busy term. We pray that all our staff take this time away to recharge in preparation for the busy term ahead. 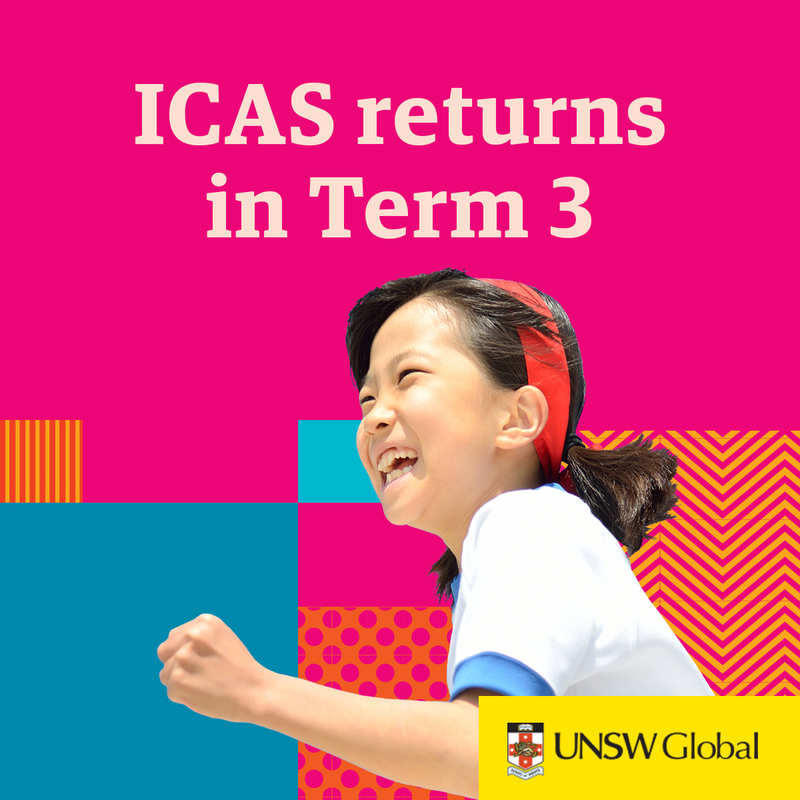 As always, we look forward to the excitement that term 2 will bring. A Museum staff member facilitated discussions about each source, eliciting information and ideas from the students about what they were looking at and providing valuable knowledge about how to extract information from sources. Following lunch and a walk, students were able to wander around the displays in small groups looking at different things such as Captain Cook’s teacup and chronometer, Mary and Ann Deane’s books gifted to them by their students, Mary Faithful’s wedding dress, convicts’ love tokens, climber, Lincoln Hall’s boots and goggles, glass eyes, a World War 1 tunic and dugout canoes. They then made notes about the source that interested them the most and reported their findings. Thank you to the wonderful parents who were able to assist the staff in caring for our students on this enjoyable and worthwhile excursion. The Year 6 project is called Jacob’s Ladder. It is made of blocks of wood and Ribbons. Kids can do all sorts of tricks with it such as creating an illusion, and letters of the alphabet. The Year 7 students have been devising improvisation pieces while the Year 8 students have been looking at scripted performance. 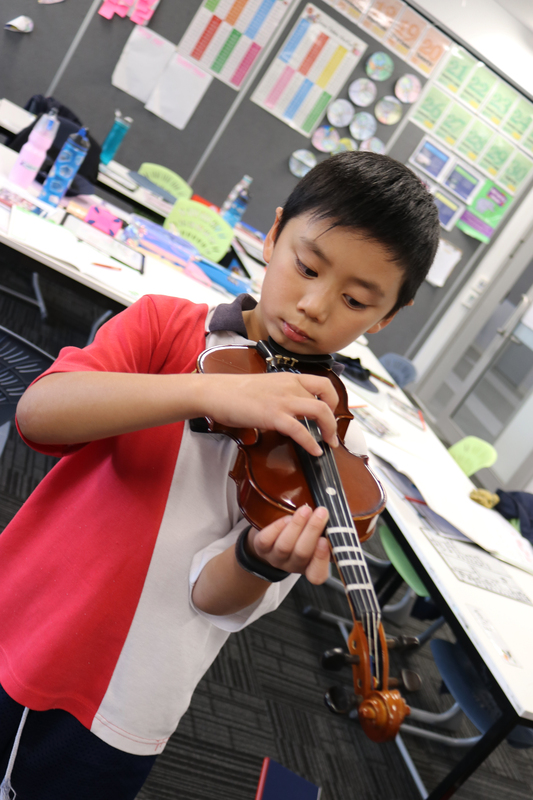 These have been a great experience in developing student’s confidence to perform and present in front of their peers. 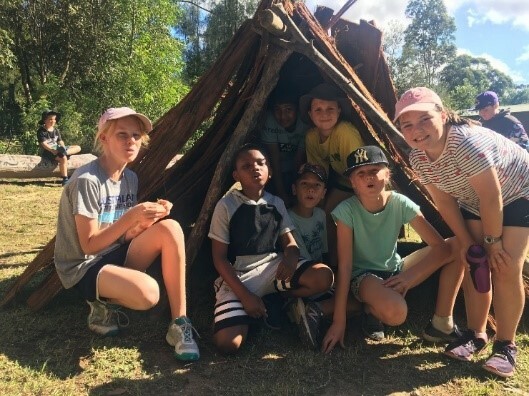 On the first day Year 5 went bush walking, learnt about the bush tucker and had a campfire at night time night while we learned about Indigenous Culture. On the second day we did activities and rotations such as making damper and touring the Gold Rush colony buildings. On the last day, we packed up our cabins and went to the Mogo. We then got on the bus and came back to Canberra. The trip took about 2 and a half hours. Here are some pictures from our camp! Too many young Australians are wracked with self-doubt, fear of the future, self-loathing and despair. Yet Christ our Saviour entered this world and said, ‘I came that they may have and enjoy life, and have it in abundance’ (John 10:10). When Christ died on the cross and rose from the dead, he promised that ‘we too might walk in newness of life’ (Romans 6:4) and experience peace, courage and hope, even in our trials. (John 16:33). What a wonderful message for our teens to hear; that even through life’s struggles and uncertainties, God loves us and plans to prosper us, to give us hope and a future (Jeremiah 29:11). 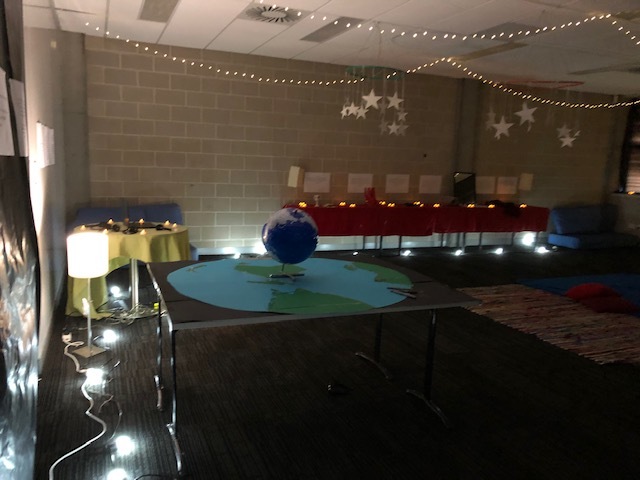 As we finish off the term, I hope that many students will visit the Easter Prayer Room in MS5, where there will be a mix of audio, visual, scripture, silence, song and opportunities for reflection and response to the Easter message. The staff and students who created this beautiful space hope that by interacting and reflecting on the death and resurrection of Christ, students will come to a fresh understanding of the significance of Christ in their lives. This Easter, I pray that you and your families find deep encouragement and hope in the fact that the grave is empty and Jesus has risen! May you have a safe and restful holiday. 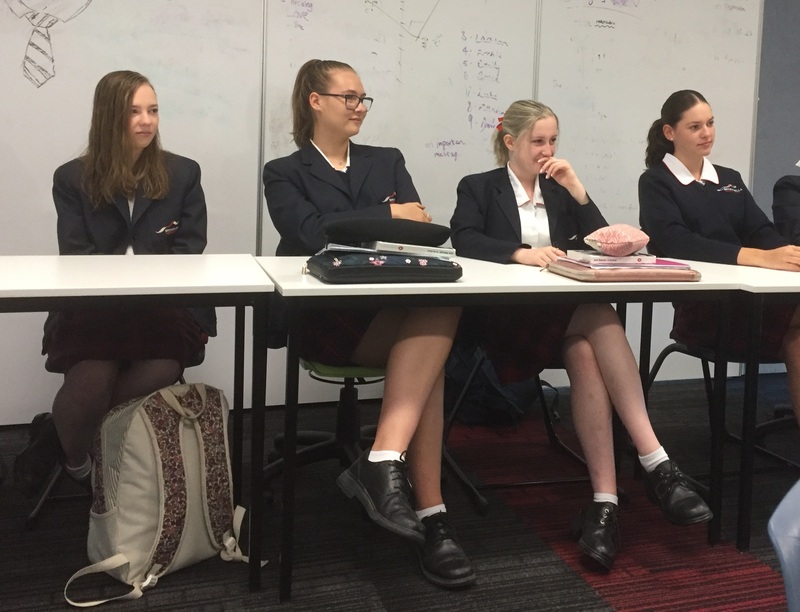 Emily, Charlotte, Elise, Anita, Gyarn and Caitlin, were treated to a 2 hour guest seminar on “The Beat Generation” and its most seminal novel, “On The Road” by Jack Kerouac. 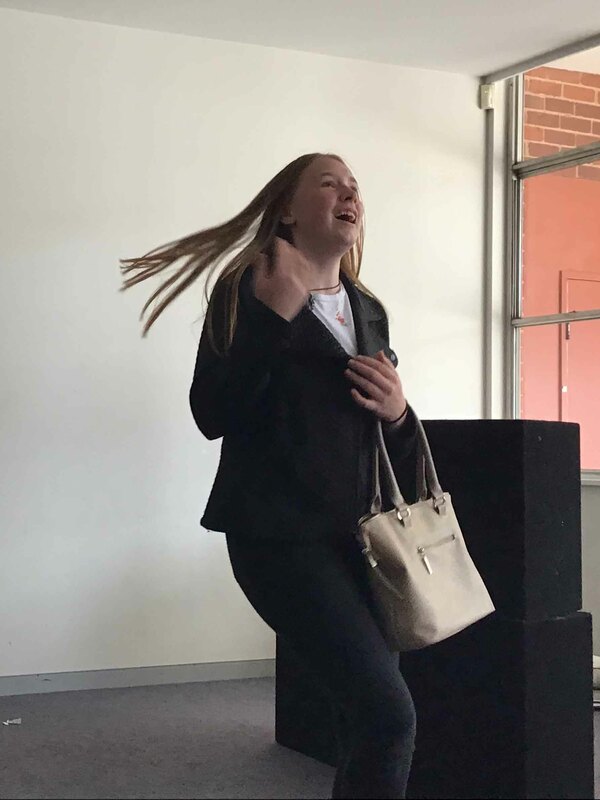 Grace spoke about a wide range of topics including literary interpretations of ‘Beat Literature’ and the philosophy behind the novel. 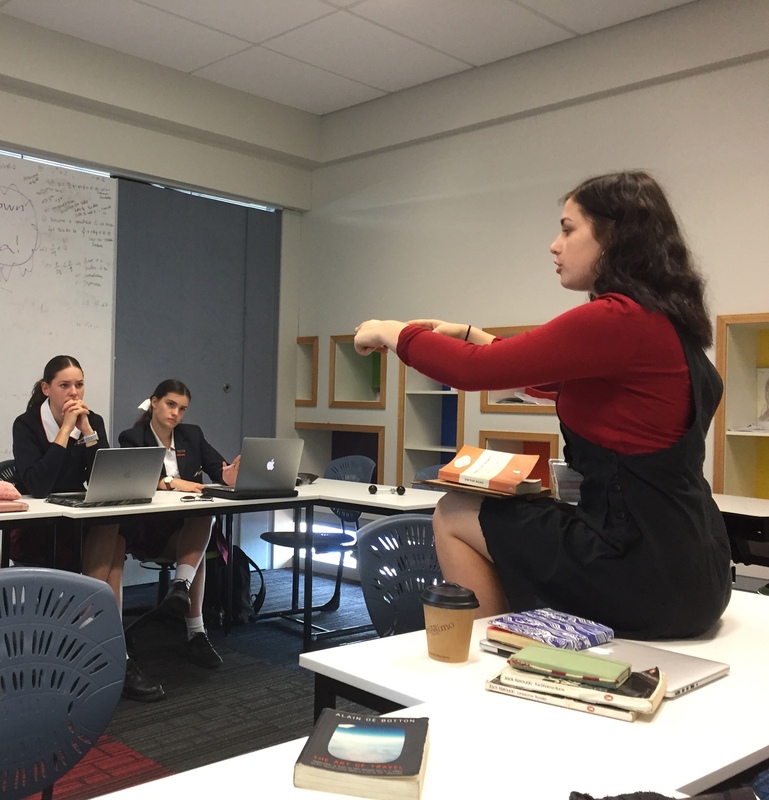 Students engaged enthusiastically with Grace and were delighted to be challenged with academically rigorous discussions and conversations. 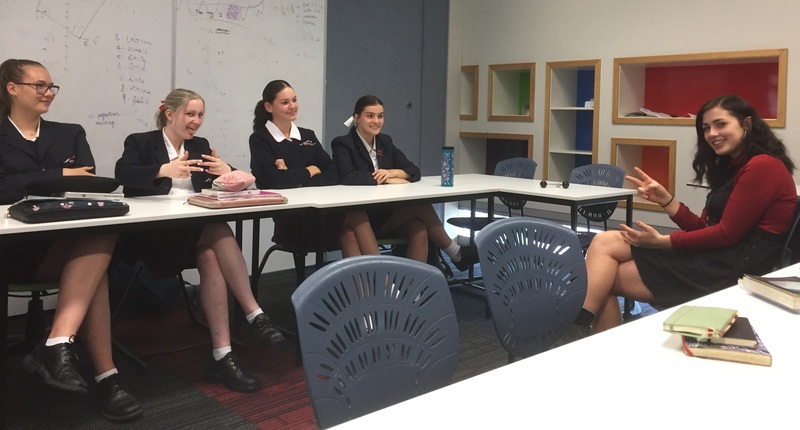 Students were keen to learn about Grace’s own study of texts at BCC and her new course work at ANU. Students enjoyed getting their hands dirty in the freshwater sampling and using the stereomicroscopes to have a look at the different organisms found in the Gardens’ ponds. The friendly rangers present, also explained how environmental factors affected the population of different species in these habitats linking the activity to the next unit of their study. 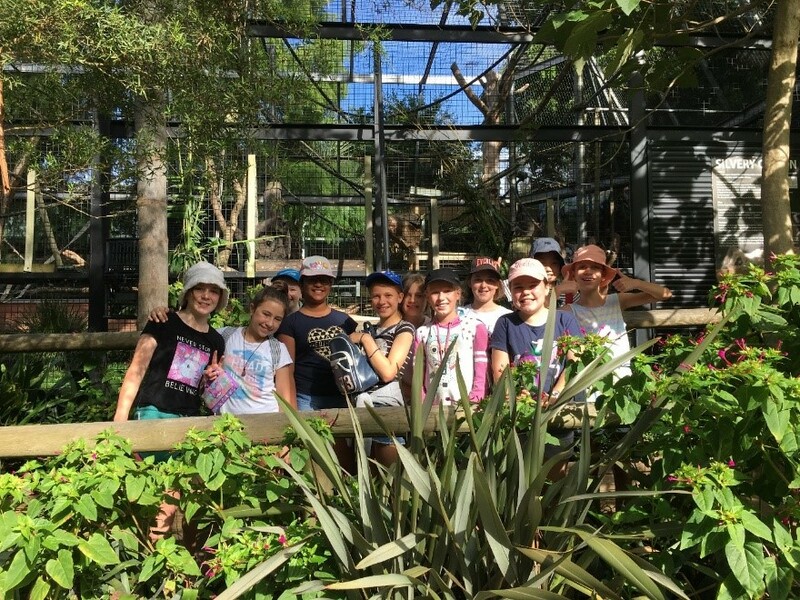 Students were also given the opportunity of looking at the different ecosystems in Australia that was set up by the Australian Botanic Gardens and to see how different plants adapted to their environment. 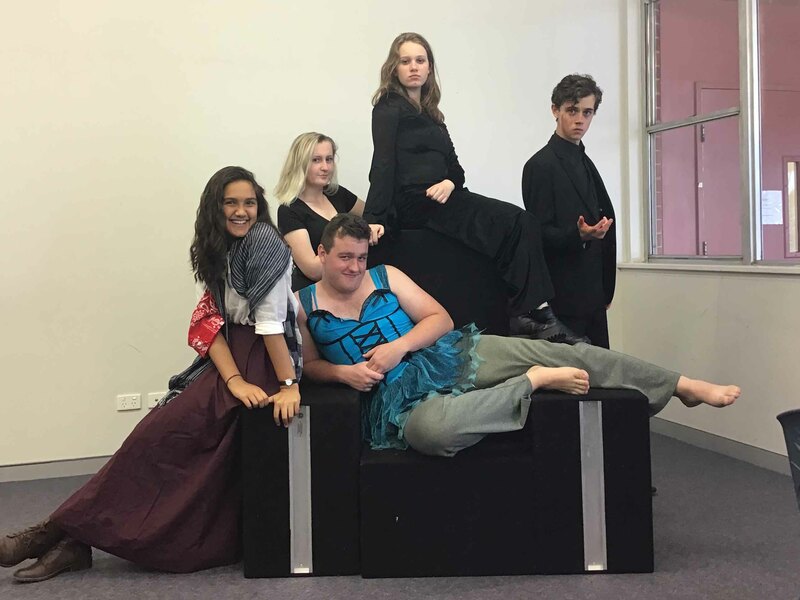 The Year 9 and 10 drama students have been devising their own monologues while the Year 11 and 12 students have been looking at the wonderful world of Shakespeare. These have been a great experience in developing student’s confidence to perform and present in front of their peers. iParent is a valuable resource from the Office of the eSafety Commisioner. It is aimed at educating parents about online risks and online safeguards and provides numerous strategies and resources for parents to help their children to stay safe online. Also on the website is a link to the web page where you can make a complaint about cyberbullying and have serious cyberbullying material removed from social media sites. 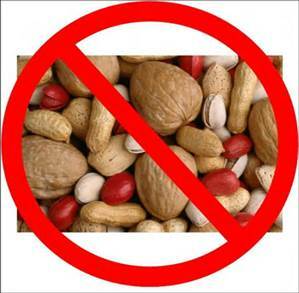 Brindabella Christian College is a Nut-Free-Zone! At BCC we have a number of students with severe life threatening allergies. Staff have been trained to supply emergency medical assistance should an accident occur. Accordingly, we remind BCC parents to read the list of ingredients on the back of products to ensure they do not send products containing nuts to school. If a product states that it “may contain traces of nuts” it can be brought to the College but cannot be shared with any students. We ask families NOT TO park in St Ninian's Uniting Church car park. 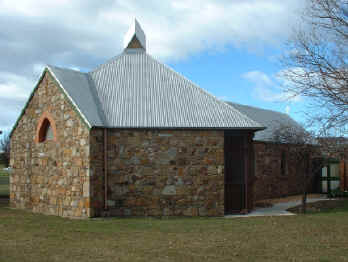 The church car park is not part of the BCC Campus and we ask you to respect their request not to park in their grounds. Parents are asked to note that school commences at 8.55am and that Brindabella teaching staff commence work at 8.25am each day. There is no playground supervision prior to this time and no guarantee that staff are on the premises. Students also have the option of attending the Before School Care. 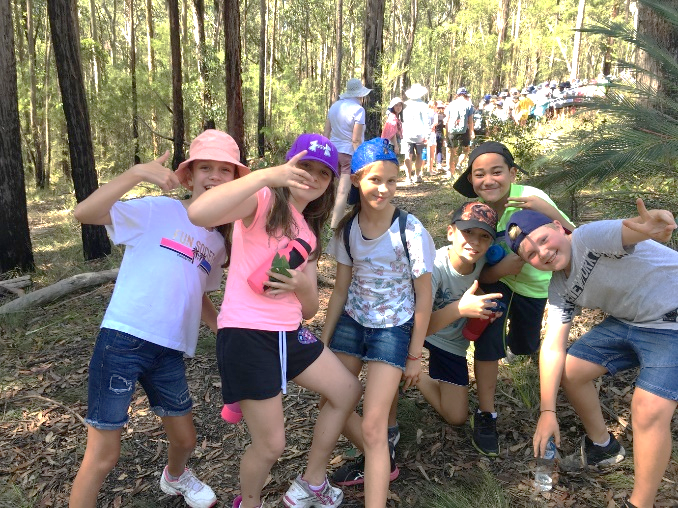 Parents please note that school finishes at 3.15 pm and Brindabella staff supervision finishes at 3.45 pm each day. If your Junior School child is onsite after 3.30 pm they will be taken to After School Care and you will be charged for the casual fee. 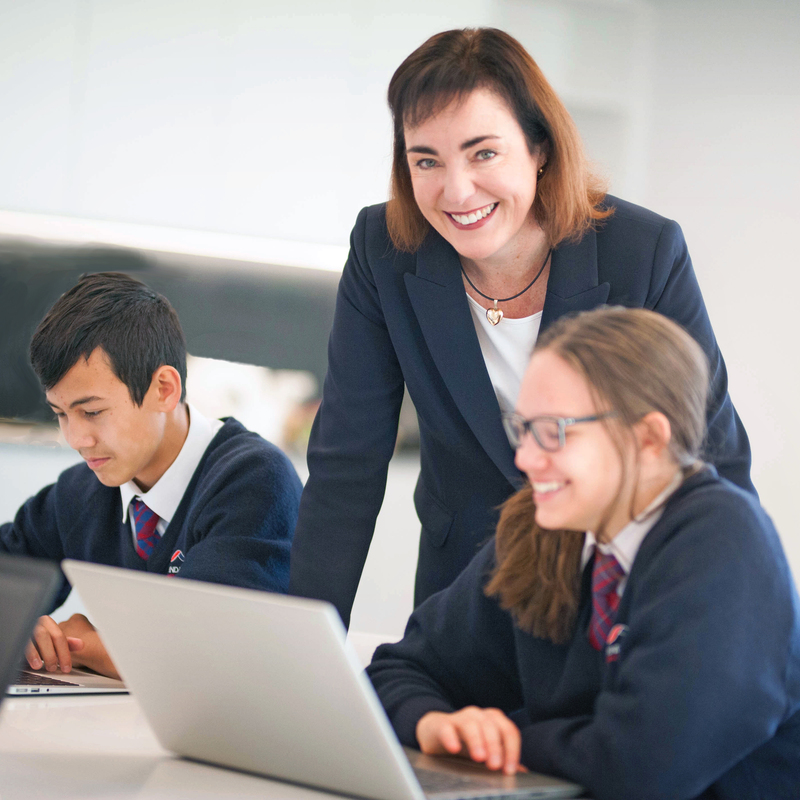 If your child is in Middle or Senior School they are welcome go to our BCC Library from 3.30 pm - 4.30 pm. 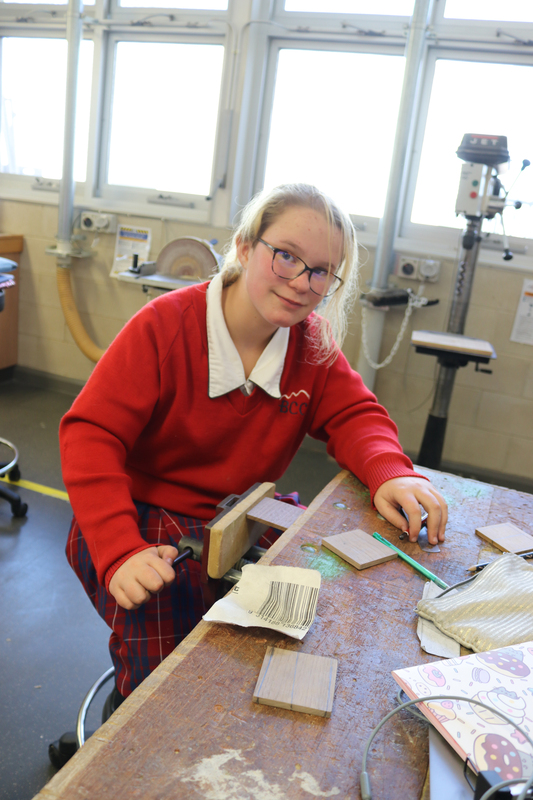 Younger students who are onsite after 3.45pm should be enroled in After School Care. One form is to be completed for each child every year. Please note that no bookings will be accepted without a completed OSHC Enrolment Form. 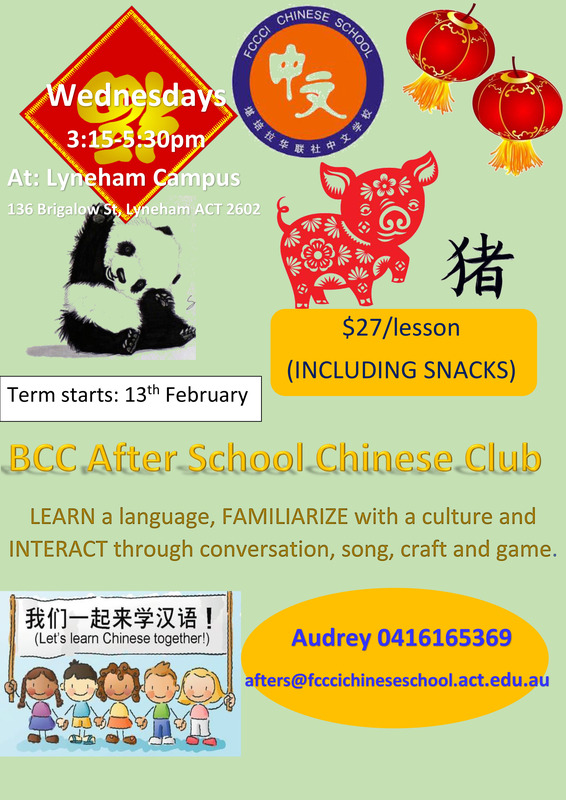 See http://www.bcc.act.edu.au/lyneham/quicklinks/afterschool-programs for further details. Is your Working with Vulnerable People Card up-to-date? Once you have a current WWVPC card, please come to the BCC Front Office so we can put a certified copy on file.